I think I bit off to much to chew. It IS my fault. No denying it. I wanted a house with a garden. Numero Uno of House Prerequisites from when it was compiled back in 2005. There were only 2 items: a garden and bedrooms for guests. Both checked off after 4 years and once il Poggiolo was found and bought. 2009. Awesome year. Gosh! Nearly 10 years of second-home ownership. What would You say to that? Let’s sell and move to France? Not just yet. Je ne suis pas prêt. Hopefully, not that I’ve gotten too old. I am. Fatter too. Both show. They are intertwined, damn-it. Just cannot handle the thrice-yearly garden assaults. Cut & burn, mostly. No time to piecemeal it either, say, every Saturday AM. Would be nice to have a gardener come. A full-fledged one. Guys only. Women, apparently, don’t do those kinds of tasks here in the Lunigiana. Nor do the guys, really, if we were are not talking about olives trees, vineyards or, orti… vegetable gardens. All else is out-of-the-question. A neighbor has a lawn-service which comes about twice a year from the Versilia, over by that Med-Sea. I don’t really know the people. They live year-round, like the lawn-service, over at the Med-Sea, keeping the Codiponte family home next to the scuzzy bar in pristine condition for the Sagra Appearance on the first weekend of September. However, their garden is no big beans. It is a small, ornamental slip of grass with a mock-well done up in reinforced cement and faced in stone with a cute little roof in terracotta… and a dangling copper bucket!! !… a couple of scrawny trees… a weeping willow and a plum tree… plus some tuffs of pampas grass. You HATES pampas grass. I kind of like it. Reminds me of that tacky 70’s deco-scheme of spray painting the pampas fronds da-glo fuschia and planting them in some overly decorated Mexican urn. At the front door. Or in the LR. I think the lawn-service would freak, if they saw what all needs tackling at il Poggiolo. Anyway, I lost their card. Too much trouble to hunt on the Internet. And a bit difficult to get folk to come to Codiponte. Pool and lawn services and repairmen for appliances. Found out by a vicarious route that our painter’s son would/could do yard work. But, when I tried to fix an appointment, the painter said his son preferred working as a painter. With his dad. Ah, Italy. The country invented… Like father, like son. In other countries it is called nepotism, though low-grade for our painter’s kid. Jobs are hard to find here so, bumping into one at the dinner table at home beats the anxiety & stress of il Job Hunting in the outside World. About all I can scare up are a couple of folk to do odd & ends: the Real Nice Lady below us comes and consults on roses… a perennial disaster… and a Real Nice Man from the other side of the village comes to prune fruit and olive trees… less of a disaster and more an art. The heavy garden attacks are my responsibility. Though physically taxing, cumbersome of effort and time and stamina, I like doing most of it myself. I ably provide plenty of fodder for You for his usual tours of the garden before sitting down to a home-cooked meal when, between bites, I am furnished with a running synopsis of what he found lacking with my labors. All this verbiage is about the soon to-be-installed Dog Fence. I have A Mission!!! But, let me say right off the bat… I expect a standing ovation from the Codiponte community-at-large for this bit of domestic infrastructure. They have made my life an inferno, thanks to the appearance of our adored Weimaraner puppy. His exuberance has known no bounds. 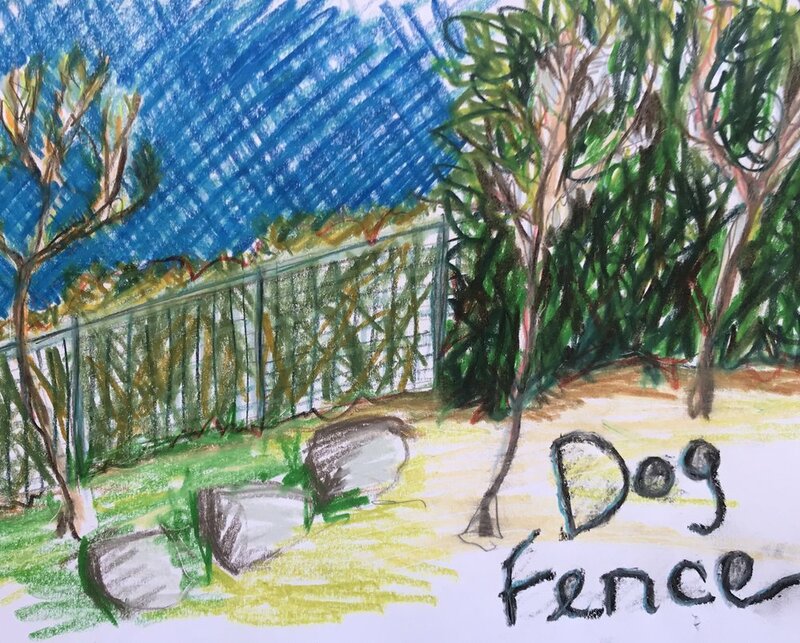 It will and in about 5 days time when he runs smack into the Tuscan green wire fencing around the entire perimeter of il Poggiolo. Oh, boy… what fun. I am in full swing with the Dog Fence prep. Major undertaking. Big push. 2 fellows are waiting for a High Sign that I have clipped and pruned and cleared a narrow swath past, sometimes in between and around all the shrubbery You and I have planted from 2009 onwards. My handy-work relies upon a battery-operated hedge clipper, cesoie… or, sheers, pruning scissors, rakes and a wheelbarrow. I am almost there. Then, watch out Puppy! Kat Killer or, how do you like our leash laws?